Aztec Orange: Week 20 - Time for an update! Week 20 - Time for an update! Well what can I say, sorry for the non blogging the last month or so, life just passed me by. So here I am almost 20 weeks through the 30 week plan. Here's a few headline statistics. In those 20 weeks I have missed 1 day of training through illness (food poisoning) so I've been really very lucky to avoid injury & illness overall throughout the 5 months or so. Next week begins the final run for home, 10 weeks of 'peak' phase training, volumes & intensity goes up again, swimming distances go up to 10.5 km a week from 9 & the volume of Zone 4 (anaerobic) work goes up to around 20% of the total. 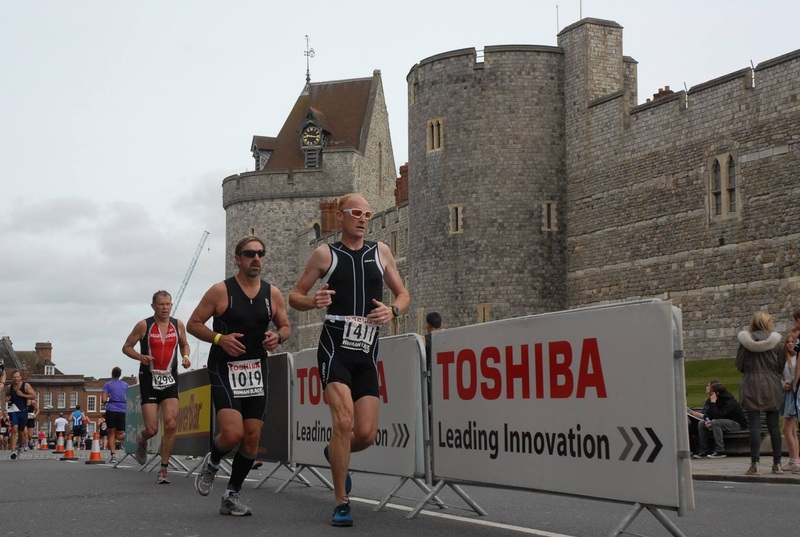 There's also a half Ironman to look forward to in a few weeks time at Marlow with F3 Events. On the subject of races, I raced the Toshiba Windsor Triathlon a few weeks ago, its an Olympic distance race so 1.5 km swim in the Thames, 42km cycle & a 10km run. Finished in a respectable 2hrs 34 mins placing 55th in my age group, not too shabby for an old git. In the grand scheme of things an Olympic distance race means nothing in terms of an Ironman distance race though! Just good practice at transition & a good open water swim practice. Here's me on lap 1 of the run, looking and feeling fresh!